"The Choreography of Everyday Movement" envisions, as a topographical mapping, the culturally inscribed nature of our everyday travels. Using GPS, the project seeks to render visible our movement through the built environment of the city, revealing socio-political and poetic patterns of traffic flow through the urban body. In these drawings we see images as often as we detect the privileging of one route over another, the concentration of movement through particular neighborhoods, and the repetition and variation of a traveler's movement over time. "The Choreography of Everyday Movement" takes process and performance as the subject of the work. As a live element, participants are tracked with global positioning satellite receivers as they move about the city. 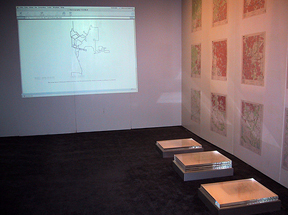 The trail of each participant's movement is transposed into visual terms as a dynamic drawing generated in real-time wirelessly over the Internet. 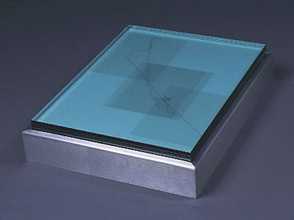 Drawings are then archived and presented for viewing in a three-dimensional format. 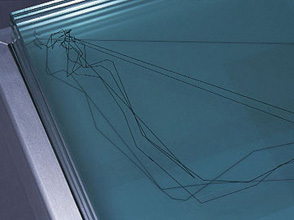 Each journey is printed on acetate, registered against prior journeys, and sandwiched between stacked 1/2" plates of glass. 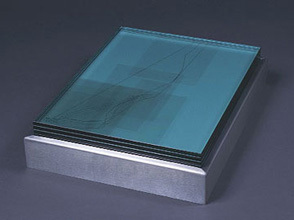 The stacks of glass grow taller over time with the addition of subsequent drawings, thus creating an expanding "z-axis" through which the viewer can observe changes in the movement of each traveler over time. The performance of the piece requires no special expertise. Dancer/pedestrian, performer/spectator, artist/non-artist each is equally capable of participating in the making of the work. 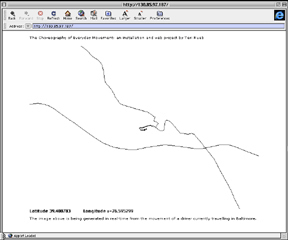 Geographical reference data, present as longitude/latitude coordinates in the real-time drawing, is removed in the final image so as to foreground the expressive character of the line---a line upon which we project our own interpretations. This one looks like a deer, that one like a figure with arms stretching upward, legs intertwined. The global positioning satellite receiver, designed for precise measurement and tracking, is subverted and re-cast as a kind of giant pencil or tool for making chance compositions. Marks that reveal the design of transportation grids become compositions that engage the imagination like clouds in the sky. The relationship of performer/spectator is re-configured in the real-time generation of drawings over the internet. The performer is only visible as an ant-like dot crawling across the screen. Movement and physical presence are reduced to the most basic abstraction, yet we are amused by what appears as a dynamic animation punctuated with moments of unintended physical humor as the little dot stops at a traffic light or crosses over the path of another performer. The performer is insulated from the gaze of the spectator both in the moment of performance and in the recorded image of that performance. The viewer never sees the body of the performer, nor vice versa, creating a shifted and mediated economy of the gaze that stands in contrast to traditional live performance. This project was originally developed in the context of a group project funded by the Rosenberg Gallery at Goucher College curated by Laura Burns. The project involved an 18-month dialogue between myself and Denise Tassin (painter), in collaboration with Goucher faculty and students: Professor Amanda Thom Woodson (choreographer), Andrew Cole (composer) and Kirsten Maurer (dancer). It was presented with the participation of dancers from Amanda Thom Woodson's senior dance studio, Fall 2001.